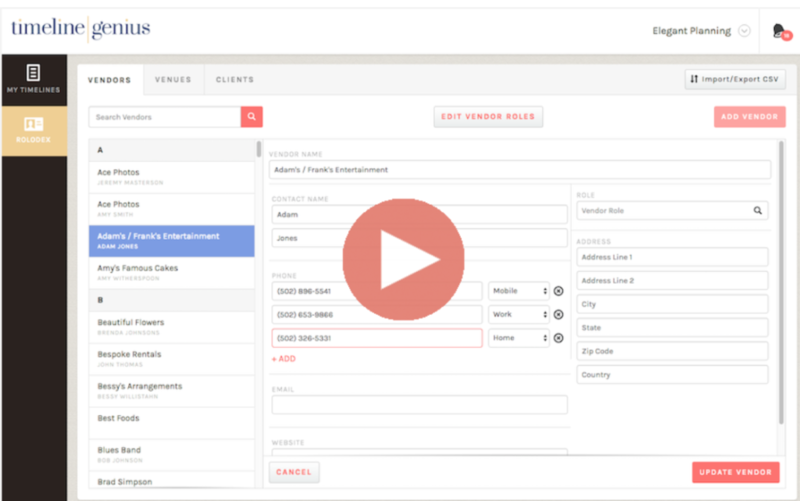 Create professional wedding timelines with ease. As you know, Timeline Genius helps you stay organized and efficient by letting you save the contact information for your clients, vendors, and venues in a virtual rolodex. And the idea behind our rolodex is simple: we want you to have easy access to all of your contacts on all your devices (computer, smartphone, or tablet). 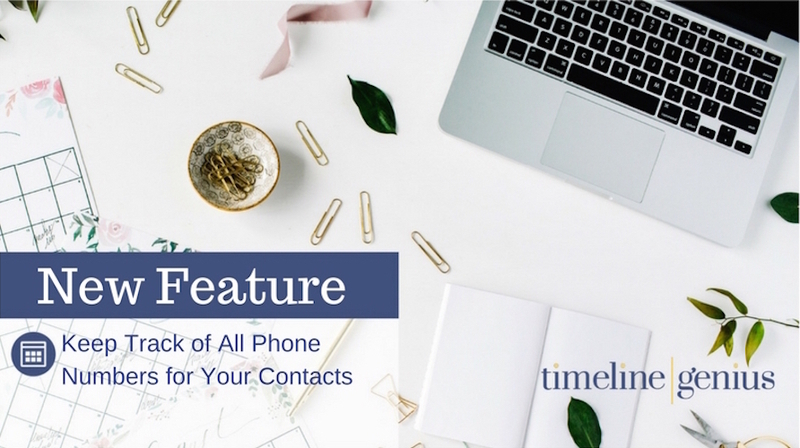 Today, I’m happy to announce that our rolodex feature just got even better because you can now save multiple phone numbers for any of your contacts! You can also designate each phone number as being a home, mobile, or work line. So let’s say you’re on-site for a wedding, and you need to make an urgent call to a vendor… Now you’ll have all of the phone numbers for that vendor conveniently listed in your timeline and accessible to you on all of your devices. To see a tutorial for saving multiple phone numbers in your rolodex, you can check out the video below. We hope this new feature helps you work with even greater efficiency and confidence. And we’ve got more exciting features coming soon, so stay tuned for updates! Hello! I'm Amanda, the Content Director for Timeline Genius. I love telling stories, drinking coffee, and planning great parties. Looking for a place to share your best wedding planning advice? Contact me through the Submissions link above. Elevate your planning! Sign up to get the latest planning resources, tips, and industry insights from Timeline Genius! Copyright © 2015 Timeline Genius LLC.